Decorating for a Hello Kitty themed birthday party? Print out these unique free pastel light orange quatrefoil pattern chalk-style Hello Kitty paper chains and link them together for an easy and quick Hello Kitty party decoration. 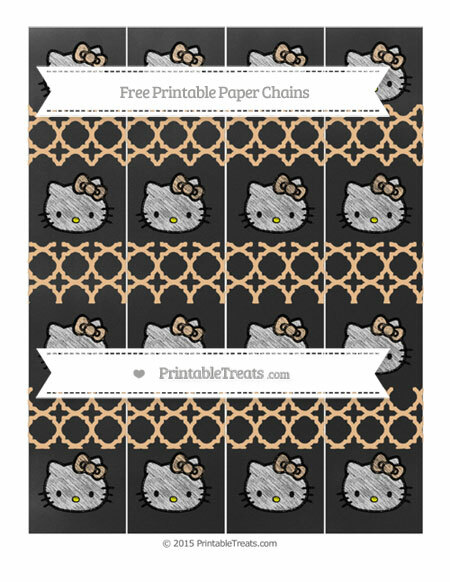 This cute Hello Kitty paper chain set has four paper chains on one page. They are decorated with alternating blocks of color and Hello Kitty faces in chalk style all on a blackboard background. These paper chains are perfect for use in decorating a birthday party or for a Hello Kitty themed baby shower. They are also a fun activity for children to put together on a rainy day. Note: PrintableTreats.com is in no way associated with the Hello Kitty brand. Copyright and trademark of Hello Kitty belongs to the Sanrio Company. I’m just a fan doin’ some fan art!